From our Lighter Side, department: Back in the day, Cracked magazine was a rival/rip-off of Mad magazine — two publications I devoured regularly. However, nearly a decade ago the defunct magazine re-emerged as my favorite go-to humor site. They write a lot of nonsense to be sure (albeit pretty funny nonsense), but they’re also an oasis of impressively researched articles packed with fun facts. And occasionally those fact-packed articles (or if you like hip Internet slang, “listicles” … articles made from lists, such as 10 Things You Never Knew About ‘Welcome Back, Kotter!’) revolve around insects. 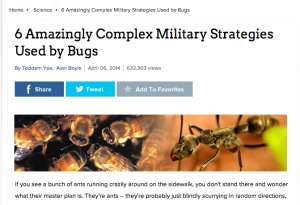 We recently stumbled across a great archived articles on Cracked’s site, titled: ‘6 Amazingly Complex Military Strategies Used by Bugs.’ Among the six sub-headlines are facts like #4: Ants Use Mercenaries and Forge Alliances. Or #3: Millipedes Create a Demilitarized Zone 140 Miles Long. Obviously the article’s two authors, Teddem Yee and Alan Boyle, don’t leave us hanging with such obtuse and mysterious claims. They spend several paragraphs on each point, explaining just what the heck they mean, all the while cracking wise the way the writers at Cracked.com always have. Rather than spoil the fun, we suggest checking out the article yourself, and then you too, will understand what they mean when they say (#1): Ants Leave No Man Behind. And hey, while you’re at it: Why not play fact-checker for the goofballs at Cracked. This is YOUR area of expertise … not theirs. Is there anything they got wrong? Let us know in the comments, and maybe together we can school these smug-yet-quite funny wisecrackers.